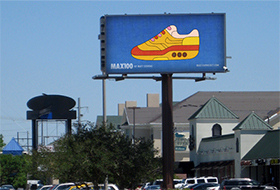 Recently, electronic billboards have been popping up alongside America's roadways, catching the eyes of motorists. The reactions vary wildly. Some opposition has claimed it is inherently distracting, focusing on safety concerns. Other opposition, however, seems to resist all new construction without regard for the support of economic growth or promoting local business. Local regulations exist to preserve proper roadway sightlines and ensure minimal eyesores in our environment. The latest wave of opposition, however, is based more upon aesthetically driven NIMBYism (or the more virulent strain of the NIMBY, the BANANA - Build Absolutely Nothing Anywhere Near Anyone) than on road safety concerns. The present data suggest that the drivers in this study directed the majority of their visual attention to areas of the roadway that were relevant to the task at hand (i.e., the driving task). Furthermore, it is possible, and likely, that in the time that the drivers looked away from the forward roadway, they may have elected to glance at other objects in the surrounding environment (in the absence of billboards) that were not relevant to the driving task. When billboards were present, the drivers in this study sometimes looked at them, but not such that overall attention to the forward roadway decreased. As this study explicitly notes, there is no appreciable difference between motorist distractions for electronic billboards versus standards billboards. The private property and First Amendment rights issues surrounding this controversial topic cannot be ignored. In general, everyone has the right to advertise, and property owners have the right to earn an income by letting people advertise on their land. The opposition surrounding electronic billboards is unfounded and hurts our local businesses. By following local regulations, billboards can remain a critical part of the financial business picture of our communities, by promoting businesses and supporting economic growth.